We’re excited to now be shipping our latest generation of fully sequential port electronic fuel injection… Pro-Flo 3 EFI! We’ve been the leaders in aftermarket EFI since 1979 when we launched our first complete bolt-on EFI system. Pro-Flo 3 continues this tradition by offering the latest in technology at a competitive price. 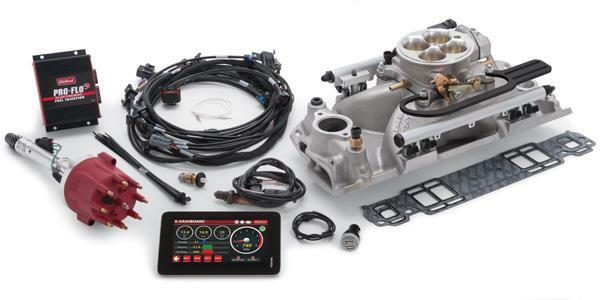 Pro-Flo 3 is a step up from our popular entry level E-Street throttle-body EFI system. Pro-Flo 3 offers the ultimate in performance and power with the precise efficiency only a fully sequential port EFI system can deliver. How does a sequential port EFI system differ from a throttle-body style EFI system? A fully sequential port EFI system delivers the fuel into the intake air flow right at the port with an injector for each cylinder, allowing for better fuel atomization and distribution. The key to the system is our exclusive E-Tuner application with base calibrations that have been developed on our dyno. The E-Tuner app uses a Bluetooth wireless connection to communicate with the ECU’s self-learning capability to continually adjust the calibration to get the maximize performance of your engine. E-Tuner features a simple and easy to use setup wizard to help you get started. Best of all, the E-Tuner app is free and can be downloaded from the Google Play store, allowing you to use your personal Android based smart phone or tablet. If you don’t have a compatible device, then we also offer kits that include a 7” Android tablet with the E-Tuner app pre-installed. Another great feature of Pro-Flo 3 is the ability to control both fuel and spark from the E-Tuner app while driving – no need to pull over and make adjustments on the side of the road. E-Tuner app gives you complete control of the system with the ability to adjust air-fuel ratios, ignition curve, idle speed, acceleration fuel, coolant fans, Rev limiter and much more. Also includes multiple dash displays to allow you to monitor engine vitals and performance from your Android smart phone or tablet while you’re driving. Our E-Tuner App is available at no charge from the Google Play Store or the EFI support page for more info.